In my last post: Should I Freak Out? I Am In Need Of A Makeover Monday, I discussed why I was in dire need of some serious help with organizing. 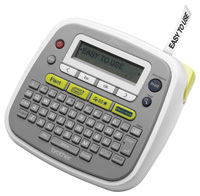 The Brother P-Touch Labeler has really helped me get organized with my son’s room. I labeled all of their bins in their closet, so Daddy would know where their toys went when he helped putting items away. Jakobi and I went over all of the labels, so he would have word recognition that correlated with the toys. I thought this was a perfect time to do letter lessons! The labeler was super easy to use, and I love how you can add different symbols and personalize the fonts. This made it really easy for Jakobi and Mason to identify which bin was which and whose toys were whose. As a matter of fact the PT-D200 Brother P-Touch Labeling System was so handy and helpful, after I labeled the boys bins, I planned a whole room makeover including wall to wall shelves which I am going to label. Then I went on to label my bookshelf, office files, and even the tupperware cabinet. Since the labels are waterproof, I can label the kids cups and plates too. This will keep the boys from arguing over who gets what plate. I know the burning question in everyone’s mind is, “Did the boys clean up according to the labels?” It is a learning process, and one that we have made fun. The symbols on the labels help create a “pick up” game where we find the items that go in the Star bucket or they ask if they can play with the star bucket. Now we have a rule where you can only play with one bucket at a time. So far so good. What organizational projects do you have to do? Check out the Brother P-Touch Website to see all of the possibilities! Here are the features of the PT-D200 Brother P-Touch Labeling System that I used.